Recent reports out of Tampa have indicated that the USF Board of Trustees are to vote on bringing a Publix supermarket to the edge of their campus by the end of next year. Part of a new student housing development, the store would be the first Publix on a college campus ever and honestly, I’m surprised it’s taken this long. I think it’s a great pairing and USF students agree. It’s going to be successful. It’s a no-brainer. And this Publix is going to be a fantastic selling point in the arms race to get the best applicants to USF. The questions then become: who’s going to do it next? We’re not publicly considering a grocery store on campus but maybe we should. Why not? What about us? And if we did, where could we put it? So definitely not an isolated Publix in the campus core. 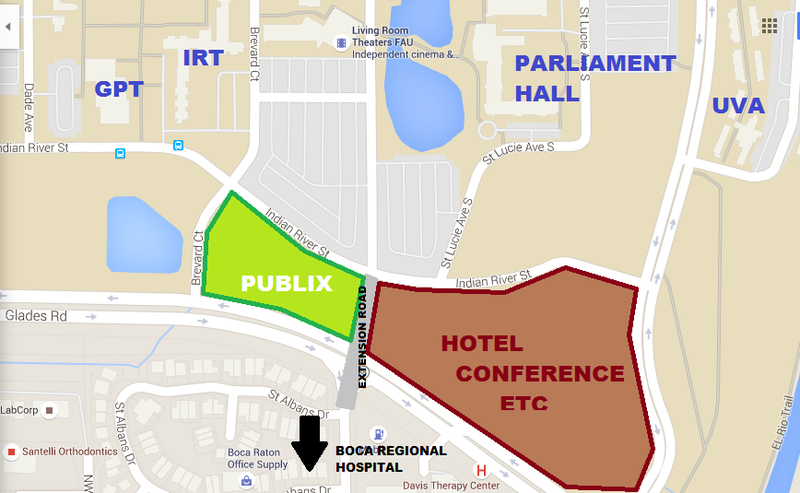 However I do think if you were to develop the south side of campus to include some of the things mentioned at the 20th Street meeting - like connecting Palm Beach Ave (the road immediately east of Living Room Theater) on campus to NW 7th on the south side of Glades as a connector to Boca Regional Hospital, the possible parking garage and hotel/conference center there, etc - that you could very easily make an argument for a small Publix over there on the south side of Indian River Blvd between Brevard and the extended Palm Beach Ave. That way the store would be both on campus serving students and facing Glades to serve passing traffic. Here’s what that could look like here, before FAU straightens Indian River Street as they plan to do in the future. Background courtesy of GoogleMaps, obviously. That would put a Publix within walking distance of all the south side freshman dorms (another argument for the future "freshmen don't need cars here" idea) and guests to the future hotel/conference center (which would be a selling point to a hotel developer and later a selling point for their guests). Although HPT isn't pictured you know where it is and overall you're talking about putting a Publix within walking distance of FIVE dorms (not counting Algonquin, which is officially not for students as of this Fall for undecided uses yet). That means it could potentially serve nearly 3000 residential students to say nothing of commuter students, staff and faculty who will walk over on their lunch breaks. 1) Cutting into Outtakes/bookstore business for small items like candy, microwave dinners, sodas. That said, if you're at the Student Union, you're still going to buy candy there rather than walk over to the Publix to get candy just as a matter of convenience. 2) Shopping carts off the Publix parcel and out into the regular campus. Let's say the Publix gets built there where I mentioned and you, as a student, buy $100+ worth of groceries for your dorm at Parliament Hall. After you check out you're going to walk that cart back to Parliament Hall and leave the cart outside, meaning carts are going to stack up outside the dorm. One way of dealing with this is stationing a security person at Publix during open hours and preventing students from taking their carts off the property, a cost that would likely fall on FAU. The second option would be having someone from Publix, like a front service clerk, round up stray carts on campus to bring back. They do this anyway in the parking lot, why not on campus too? Furthermore, you could see students being bored on campus and stealing a cart to run around campus with. They're young, sometimes drunk, it happens. But considering how much money Publix could make on campus – each individual store is rumored to make over $100k a day - losing a $100 shopping cart here of there is an acceptable loss IMO. 1) Would FAU want to give up a parcel like that for a private business when they could use that land down the road for academic space? I think it’s a worthwhile investment for the space and in that location it’s on the fringe of campus anyway rather than in the campus core. Plus they’re already planning to give up “potential academic space” to the hotel on the other side anyway. 2) Would Publix be interested in spending the money to open a store there considering they just spent so much money on the 5th Avenue Shoppes Publix renovation down the street? They should be. Publix has never been shy about expansion. Yes it costs a lot of money to build, stock and staff a store but they’re good investments. Publixes rarely close; they’re like banks that way. And Glades Road is prime real estate. Furthermore, if they have a Publix on FAU’s campus facing Glades, another Publix in the 5th Avenue Shoppes facing Federal Highway and one in the future University Village project facing Spanish River, they have absolutely DOMINATED this area… and that I think they would find very appealing indeed. Hopefully FAU takes this into consideration and at least begins talking with Publix about the idea. Publix is a part of Florida's DNA and It would be a huge asset to our beautiful campus.